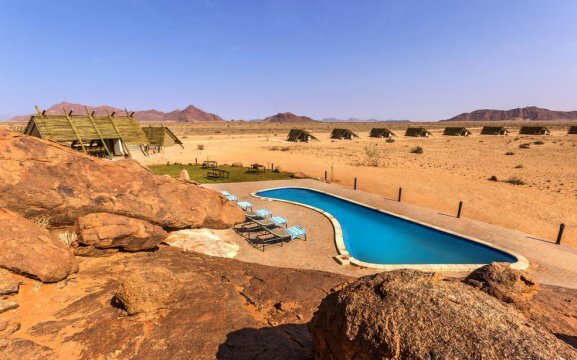 The Desert Camp lies on a 40,000ha Taleni Africa private reserve with wild and dangerous animals roaming freely around. 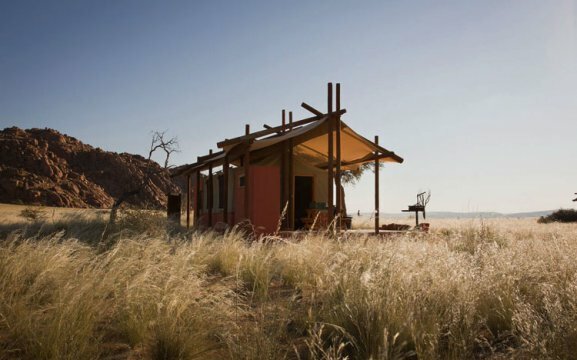 Our camp is only 5km away from the Sossusvlei Lodge and at the entrance gate of Sossusvlei – Namib Naukluft Park. It features a central communal area with a reception, bar with large-screen television, swimming pool and two “bomas” with ablution blocks. Our camp has a curio shop, internet café, Wi-Fi facility, fuel and service station near-by. For self-catering needs, guests can book a day in advance for their eating utensils and meals at reception. We also offer a chef to prepare meals at the Camp’s braai facility. 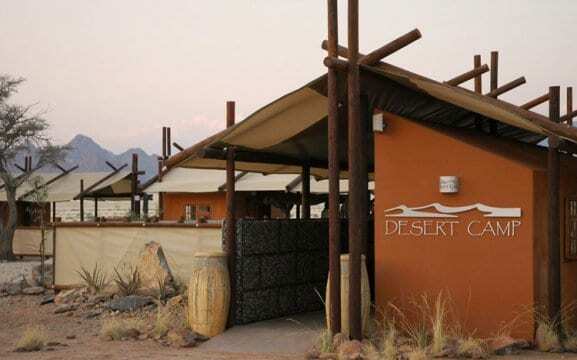 The Desert Camp has 20 self-catering units, sited either side of the communal area. 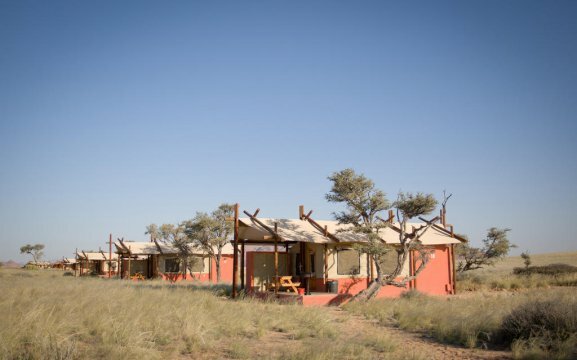 Each unit is decorated with the colours of the Namib Desert and features twin beds, a small kitchen, an under counter minibar and a 2 plate stove. There are power points for hairdryers and shavers, a wardrobe, an electric kettle and adjacent parking. Two units are wheelchair friendly and accessible from a cemented path. They are perfectly fitted with handles in the bathroom for easy access. Some of a sleeper-couch which can accommodate two children under 12 years, free of charge when sharing with two full paying adults. 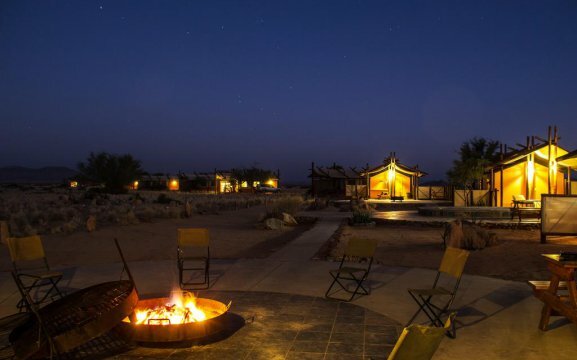 Activities include walking trails, the Sossusvlei excursions, nature drives, sundowners, eco-quad biking, quad bike breakfast run, photography, hot air balloon, birding and scenic flights. 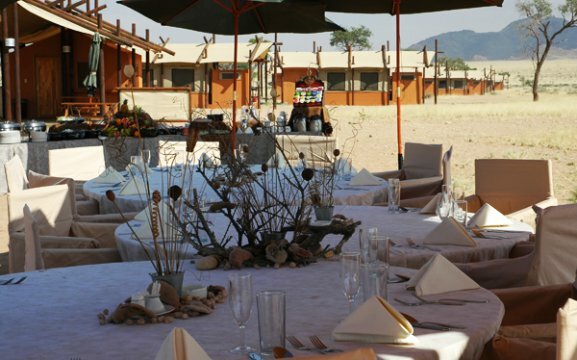 On the Sossusvlei Excursions you will learn more about the animals, plant life and the dunes. Here we offer the 2,6km round-trip walk up to the Dead Vlei, which is a must for the healthy visitor. 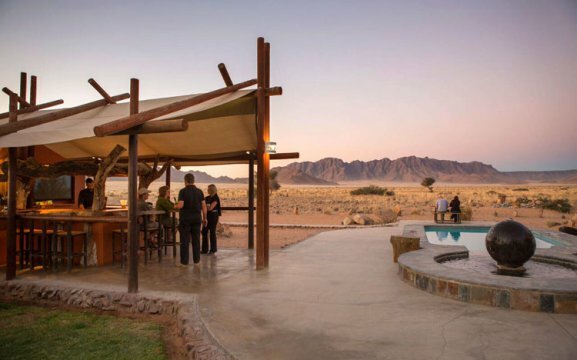 Sundowners are in the late afternoon at the Lodge’s private reserve included are drinks with a spectacular sunset. Our quad bike breakfast run is a trip to the Tsauchab River just before sunrise, here the guide will unpack the picnic basket and sets a table with all the goodies. Guests will have a 360° view of the rising sun over the mountains on the dunes on golden grass plains and on the mountains. We also offer desert scenic flights with a birds eye view with wonderful aerial photograph opportunities. 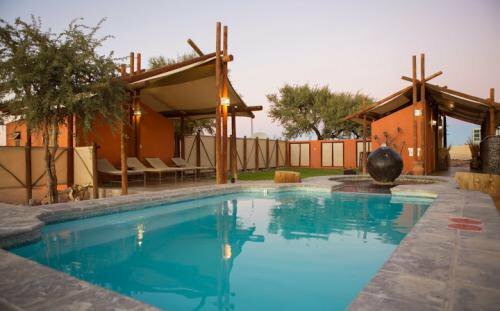 Other lodges and self-catering options close to Sossusvlei available are the luxurious Sossusvlei Lodge and the Desert Quiver Camp. 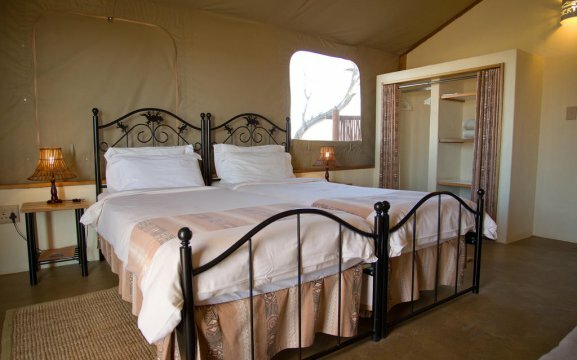 For campers we have the Sossus Oasis Camp Site which is very close to the entrance to Sossusvlei.